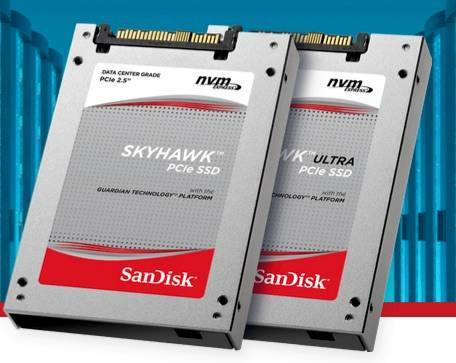 WD has introduced a Skyhawk SSD, an NVMe version, as it were, of its acquired SanDisk’s SATA interface CloudSpeed SSD, along with its very own post-SanDisk and post-HGST Skyhawk branding. Skyhawk is a low-to-medium, fast access SSD in a 2.5-inch enclosure using MLC (2bits/cell) NAND instead of the slower, less long-lasting TLC (3bits/cell) stuff and with an NVMe/PCIe interface and not the old disk-based SATA interface. The Skyhawk SSDs use 15nm NAND with a PCIe Gen 3 controller. They have from 1.6TB to 3.84TB capacity and come in a hot-swap, U.2, 2.5-inch form factor enclosure, in two varieties; Standard for read-optimised workloads, and Ultra for mixed-use workloads which has longer endurance, gained through lowering its capacity so as to have spare cells to use when existing ones wear out. Increased performance provides improved server consolidation. WD’s acquired HGST and SanDisk had their own SSD branding, such as FlashMax and Ultrastar SN100 for HGST, and Lightning, CloudSpeed and IoScale for SanDisk. We’re seeing the second WD SSD brand type here, colour-based Black, Blue and Green having been introduced already; Black for example at CES in January. 1.8 DWPD (Drive Writes per Day) for 5 years. 0.5/0.6 DWPD with 5-year warranty. 1.2/1.7 DWPD with 5-year warranty. That's useful increases in random IOPS and sequential bandwidth. But it's curious that the NVMe/PCIe interface here has a longer latency than the old SATA one. We suspect other powerful, predatory bird, mammal and fish names may be used for oncoming WD SSDs targeting other market niches. Skyhawk has a 2 million hours MTBF rating, instant secure erase and an 0.44 per cent annualised failure rate. Get a datasheet here and read a blog here.